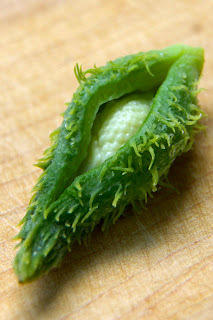 When I started foraging for food, it was just something to do for fun. But clearly, foraging is more than just a curiosity to me now. It's a big part of how I enjoy my free time and it informs all parts of my life, because my cooking is dominated by foraged ingredients. I'm even starting to learn about using foraged herbs to make medicine. It's a part of me. And you know, that makes sense. A few years back, I quit a fancy laboratory job because I felt trapped, always stealing glances out the window, my soul screaming to be outside. And now, to a large extent, those daydreams are being fulfilled. My fat tires kick up dust on the trail, and you can often find me wandering beneath blankets of pine and ponderosa. So it just makes good sense that while I'm out and about, exploring my environment, that I should be collecting for wildcrafts as well. Foraging has deepened my connection to this beautiful place where I live, has forced me to become intimate with her rhythms and tides. So it's no longer just a playful thing for me to cook with found foods, it's an expression of who I am, because I am so very much of this place. My cells are made of these Rocky Mountains, my compass always points me back home. Which is why I will be cooking with juniper much more often now. It's hard to take a step in my favorite corners of the mountains without coming upon a mat of creeping juniper. The high-altitude variety of juniper that I favor, Juniperus communis has berries that are frosty blue when ripe, and grows in low-lying shrubs with prickly needles. I know that most people think of juniper as being a pungent spice. And it's true that it has a deeply resinous flavor. 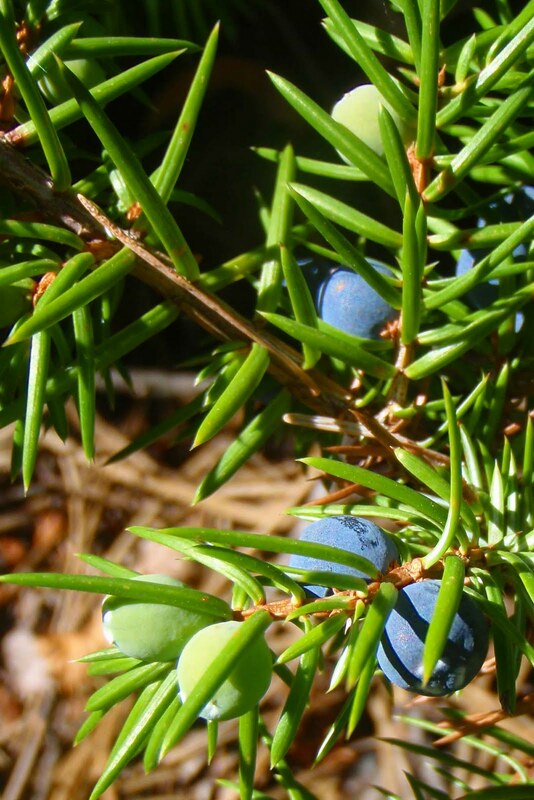 But freshly foraged juniper berries also have surprisingly sweet notes, and are genuinely fruity. This woodsy combination of flavors makes juniper the perfect pairing with all manner of game, and stronger-tasting meats. 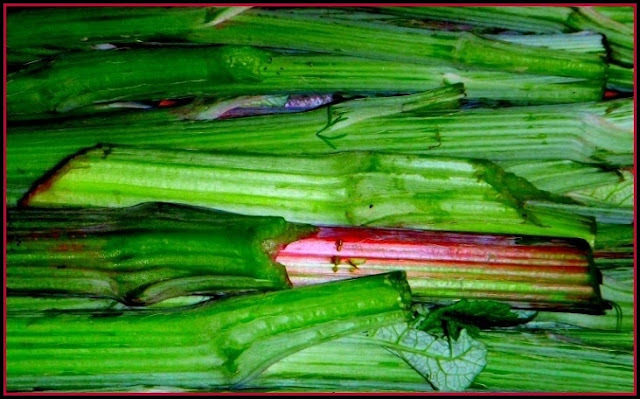 It can be used in everything from marinades and sauces, to soups and stews. Today, I used juniper as a rub on kebabs. I still had some doves in the freezer, so decided to utilize their breast meat. But you can use this recipe with whatever meat you enjoy, especially game, but it's also good on beef and salmon. 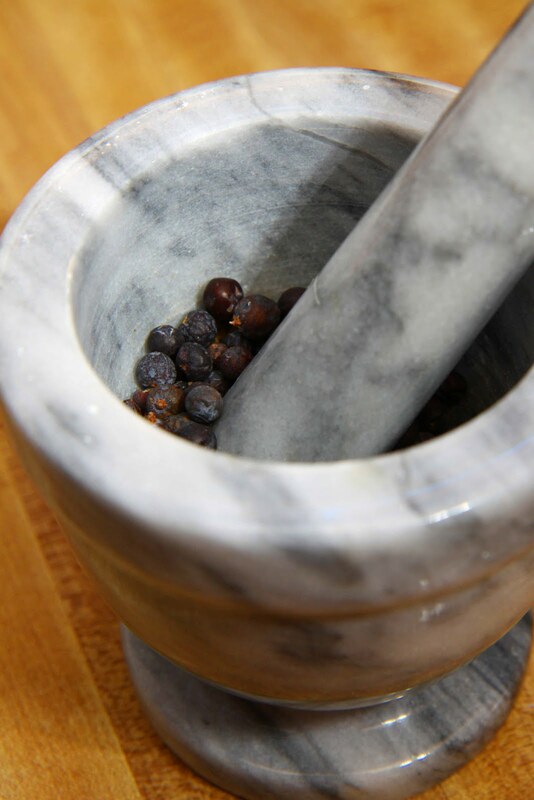 Crush a handful of dried juniper berries, either using a mortar and pestle or a spice grinder, then run them through a fine sieve and collect the resulting powder. Rub kebab-sized chunks of your meat with the juniper powder, salt, and a generous amount of black pepper, and let stand for 15 minutes. String the pieces of meat up on stripped juniper twigs if you have them, or regular skewers, brush them with a touch of melted lard, and grill the kebabs just until the meat is browned on the outside. Juniper has a magical property of making meats tasty even more savory, and doesn't really have the strong pine flavor that you might expect. 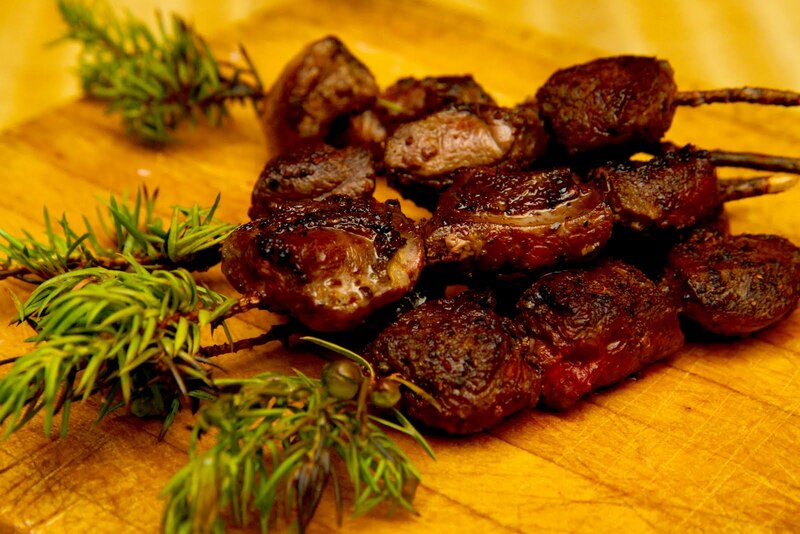 The dove meat that I used to make these kebabs just tasted more dove-y and delicious, like fantasticly wild steak bites. If you are lucky enough to harvest your own juniper, it has many other uses. Tender young branches can be used to make a yummy tea. And juniper is thought to ward off negative feelings by many cultures. You can also take advantage of juniper's disinfectant qualities by using the berries to brew up a very strong tea, and using it as a disinfectant cleaning spray for kitchen surfaces. If you'd like to learn more about some of the medicinal benefits of juniper, check out my friend Fairybekk's site, Cauldrons and Crockpots, and also learn her recipe for choucroute, which uses juniper berries. This is my entry this week into the Hearth and Soul hop and Real Food Wednesday. Please click the link and hop through all of the other wonderful recipe submissions. I love using juniper berries! It's hard to find recipes and I am definitely bookmarking this one! I think it's so admirable that you so strongly pursue what you truly love doing! So few people can say they do that! great recipe...so you just picked and dried the juniper berries--no special process? we have a juniper tree in our yard--i sort of never made the connection between it and the edible berries. how embarrassing ;)! I am fascinated by juniper, I recently made lacto-fermented sauerkraut with juniper and it tastes great! I love this post, it tells so much about you - since I was a little girl I always wanted to be OF the mountains. I however seem to be OF corn fields, and wheat fields and whatever the farmer plants fields. Not quite as poetic but I love my home! What a great post. I didn't know you could use the fresh berries. I learn something each week from your blog. What a beautiful post. It is very peaceful and I love the use of the berries. You are so kind to share your heart. Hello Ms Butter! Your meal looks divine, love your use of the juniper berries. They are good for more than just gin! These look delicious. I am just wondering if one could prepare them over an open fire, I cannot see why not. I love the idea of cooking on the stripped juniper twigs as well as using the berries. I bet that gives an amazing flavour! Thanks for co-hosting the blog hop! I had no idea that Juniper Berries could be used for culinary purposes and I have tons of them on my property. I am so excited to try this! What a wonderful post this is! I found it so interesting and learned a lot about you at the same time. :o) Loved it! What a great post, Butter - I learn something every week from your posts. I've never come across fresh juniper, but have used the dried berries, though not nearly often enough - time to rectify! Christy - Yes, I just picked them, and then dried them spread out in the bottom of a cardboard box. No special preparation. Alex - Yes I think the berries you mentioned are edible, but please check for your area. Where I live, there are juniperus communis, which have pine-like needles, and juniperus monosperma, which are small trees that are more cedar-like. Arnold - I love the idea of making these kebabs over an open fire, seems fitting. Alea - Juniper are most commonly found in gin and sauerkraut, but they are delicious in all sorts of recipes. Have fun experimenting with them! Jenny - Mmm, the smell is divine!